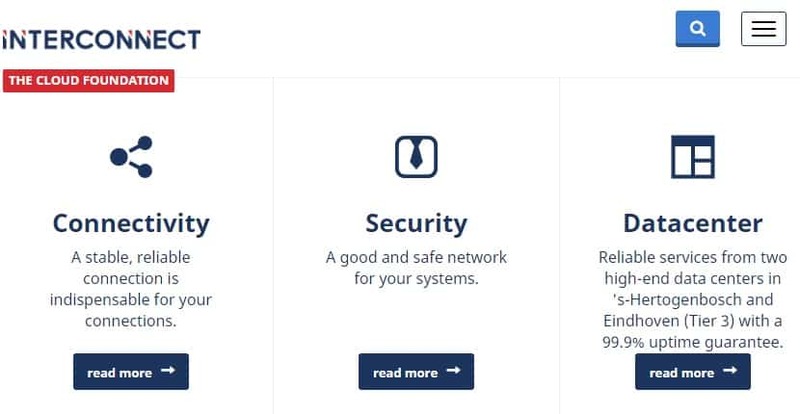 Interconnect Review 2019: Is Interconnect a Good Hosting? Interconnect is a leading IaaS company based in the Netherlands. They operate two data centers with high-end hardware and redundant network so customers are assured of high uptime guarantee. Founded in 1995, Interconnect is a Dutch IT company that offers IaaS, connectivity and Colocation in addition to local hosting solutions to local and international customers. Their Tier 3 data centers have top-of-the-line infrastructure with an own fiber optic network. Interconnect has really focused on building up their infrastructure to provide the fastest and most reliable hosting platform with impressive 99.9% uptime guarantee. They have a robust and resilient IT infrastructure that meets the requirement of everyday hosting needs as well as the colocation needs of their clients. Their two independent self-owned datacenters make use of their own fiber optic network to deliver fast server access. They also make use of energy efficient redundant cooling, power and network to give their clients the stability they need. And since security is a big issue today, they employ a number of features to protect your data. The first is a managed firewall to that filters the traffic that goes into your website. Secondly, they have an anti-DDoS tool that protects your servers from malicious attack. So your servers stay clean and your services accessible. Don’t worry about data privacy or safety. They channel all your sensitive data via secure IP-VPN connections. One of their key selling points is a custom control panel from which you can handle various aspects of your hosting account. Their user-friendly panel lets you upload files, create personalized email accounts, manage databases, configure security settings, and much more. You can access your account remotely as long as you have access to a PC and internet connection. Overall, I found the control panel easy to use and didn’t have a problem setting up the emails and database. Interconnect offers competitive pricing for their hosting options especially when you consider the fact that they specialize in Windows hosting. You can choose quarterly billing or annual billing cycles. If you choose the colocation service, you will have to pay a small setup fee. Customer support is the back bone of Interconnect. You can rely on their knowledgeable and dedicated customer support team to assist you with server configuration and hardware replacement. You can reach them by phone, Twitter, and email during normal working days and half a day on Saturday. If you’re in Netherlands and have time, visit their data centers for a free walkthrough of their facility. I also encourage you to check out their technology blog for the latest news and updates. Interconnect is a fantastic choice for customers who are looking for reliable IaaS hosting for their web apps or service. They offer competitively priced hosting solutions backed up by an excellent infrastructure. Check out Interconnect’s web hosting options today! Wondering how Interconnect stacks up against other Web Hosting companies? Enter any other Web Hosting company and we will give you a side-by-side comparison.